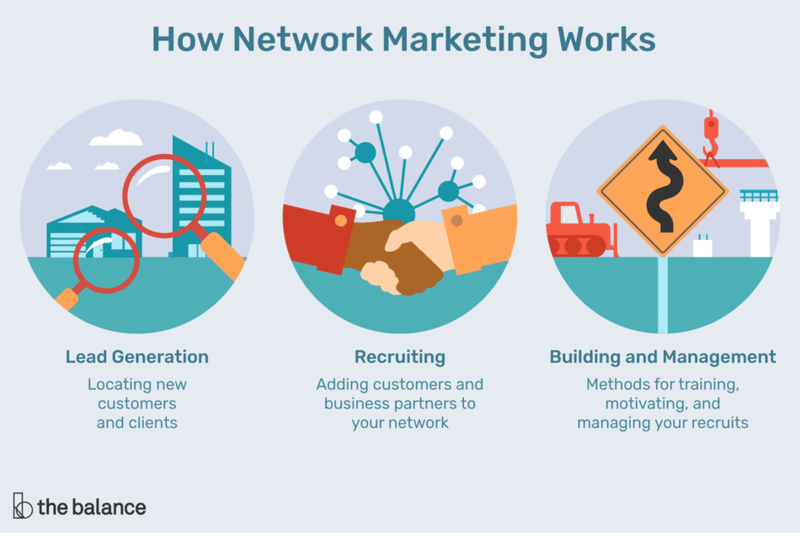 The Network Marketing Business Model: Is it Right For You? Building and Management: Methods you use to train, motivate, and manage your recruits. There are many types of network marketing including two-tier programs and multi-level marketing, but many of the more solid marketing companies, like Avon, are single-tier. You sign up for an affiliate program to sell their product or service. You do not need to recruit other distributors and are only paid if you make a direct sale. Avon, is a company that uses single-tier networking marketing. In some online affiliate programs, you are only paid for traffic you have referred to the affiliate's website. Pay-per-click (PPC) and pay-per-lead (PPL) affiliate programs are other examples of single-tier networking. This term applies to network marketing that pays you for direct sales (or traffic you refer to a website) and for direct sales or referred traffic made by affiliates or distributors you recruit to work under you. An example of a two-tier program is Ken Envoy's Site Sell. Multi-Level Marketing (MLM) is a distribution-based marketing network that is two or more tiers "deep." Some MLM programs allow you to make money five or more tiers deep. Examples of MLM businesses include LuLaRoe, Magnetic Sponsoring, and Amway. Two other types of network marketing strategies are marketing-driven networks and name-driven network marketing. Martha made $200 in sales commissions at her first Pampered Chef party. She joined the single-tier marketing program to make commissions on her own sales and bonuses from recruiting other networkers. Martha earns money from her own sales as well as when she gets others to join the network and who make their own sales. Are You Thinking of Network Marketing as a Business Model? If you are thinking of starting a business that will rely on multi-level marketing of any kind, be sure you have a solid marketing team at the very core of your organization. The stronger your base of marketers, the more successful you will be in the long run. It is also important to point out that not everyone who wants to sell something will be good at it. But if you have someone excited about your business who might not be a perfect fit for your sales team, find another spot for them. Marketing is critical to the success of any business, but don't forget that sincerity (genuine enthusiasm about a company or product) in and of itself is a form of marketing. If your only incentive to your sales team is money and make more money, they may cut corners or mislead others in an attempt to earn more for themselves. You should also take the time to research your own state's laws regarding network marketing to make sure that your business is fully compliant. Deceptive marketing practices and pyramid schemes can land you in hot legal water trouble if you are not careful. Hire people who are even more excited about your company than you are!